'Cricket Diplomacy': Even Saddened Pakistani Fans See Some Good : The Two-Way Though deeply disappointed that Pakistan's cricket team lost to India today in their semifinal World Cup match, some fans were also struck by the potential meaning of the match between the two archrivals. 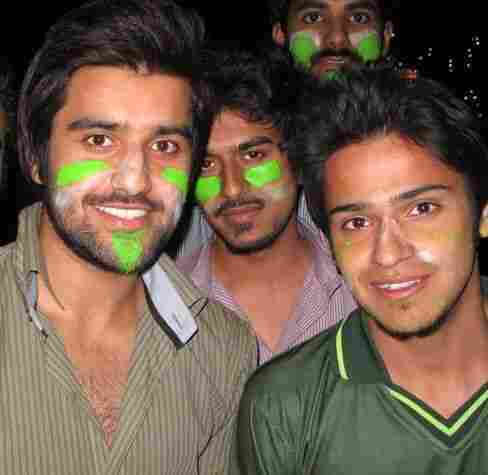 Though deeply disappointed that Pakistan's cricket team lost to India today in their semifinal World Cup match, mechanical engineering students Arsalan Ghazi and Danish Ilyas were also struck by the potential meaning of the match between the two archrivals (politically and sportingly). They watched with thousands of other fans on a large screen set up in an Islamabad park. Afterward, Ghazi said, "It's a game." He mused about how even though one match can't bring peace, "sports does unite nations." More matches in the future can only help that process, the friends said. This was indeed a competition laden with political significance. As my NPR colleague Corey Flintoff and I reported on All Things Considered, Pakistani Prime Minister Yousuf Raza Gilani watched the game with his Indian counterpart, Manmohan Singh. Pakistan's loss notwithstanding, Gilani said afterward that "today's match brought the people and leadership of the two countries together. This, I believe is the positive outcome of today's semifinal." And, Gilani added, "let me convey to the people of India that Pakistan desires good neighborly relations with India. The resolution of all issues through dialogue will bring peace and prosperity to our people." India goes on to play to Sri Lanka, in Mumbai on Saturday.